IP addresses such as 64.5.33.76 are used to identify every PC connected to the Internet, but don't provide any detail about where a system is physically located. There are times when it would be handy if you could make the connection between an IP address and a geographic location. Perhaps you want to trace the source of a hacking attempt, or determine where a Web site offering too-good- to-be-true deals is actually located. The easiest way to get the job done is by employing the services of a helpful alien. Alien IP is basically a network diagnostic tool, but one with an appealing difference. 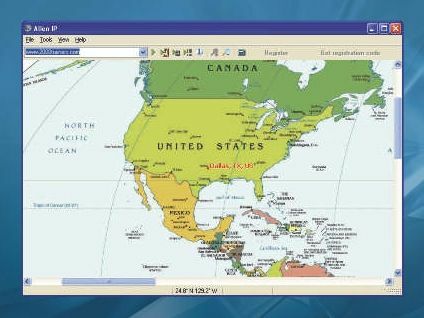 When you enter a domain name or IP address in the program's search bar, the location of that PC is plotted onto a world map for easy geographic identification. Press the Host Info button and you'll also be provided with details like longitude and latitude information for the host town or city. Alien IP also includes tools aimed at network diagnostics. After you've entered a name or address, for example, you can click other buttons to ping the host or trace a route to it. Want to find the name associated with a given IP address? That's easy too. These features don't result in any display changes to Alien IP's world map, unfortunately, but the text-mode output does get the job done. For the more technical user, Alien IP makes it easy to perform what are often considered complex undertakings. For Webmasters, Alien IP can be 'fed' a list of IP addresses from server log files and then resolve them all a saved list of associated host names. Similarly, host locations can also be traced in bulk and saved to a file for better geographic identification of visitors. Any network administrator who has even had to calculate correct IP address ranges or subnet masks will find the built-in IP calculator a huge help.